Musical polymath Beck has an ongoing project called "Record Club" where he and various guest artists cover entire albums, just for kicks. 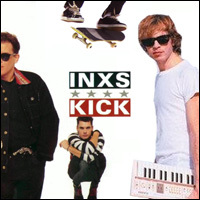 And they're getting double kicks (ADVANCE APOLOGY FOR LAME PUN) with their latest effort - INXS' seminal 1987 album, Kick. The results are being released in weekly installments and, so far, they're three tracks in - with a scuzzy Guns In The Sky; a spooky take on New Sensation and a not-very-good-at-all Devil Inside. Next up is Need You Tonight. Here are the videos, which feature Beck alongside Liars, Annie Clark and Daniel Hart from St Vincent, Sergio Dias from legendary Brazilian band Os Mutantes and Brian Lebarton. I'll keep an eye out for any further gems. Record Club: INXS "Guns In The Sky"
Record Club: INXS "New Sensation"
Record Club: INXS "Devil Inside"